Book 1 of the FALL Issue. 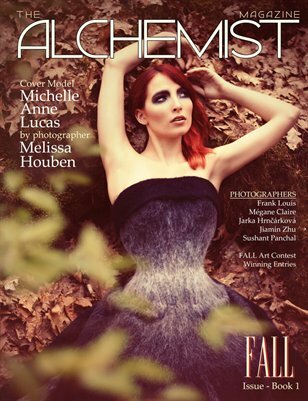 Cover model Michelle-Anne Lucas photographed by Melissa Houben with MUA Sarah Alderliesten and dress design by Jeroen van der Klis of Bizarre Design. Photography by: Frank Louis, Megane Claire, Jarka Hrncarkova, Jiamin Zhu, and Sushant Panchal. Also featuring the winning entries of the Fall Illustration Contest: Diana Todorova, Svetlana Makarova, Daniel Velasco, Britney Combs, Agata Jabłońska, Sara Delli Castelli, Lucy Alice Gibson, Kilee Delaney, Kate Love, Karisa Perrone, Zuzana Osako, and Yashara Hynes.